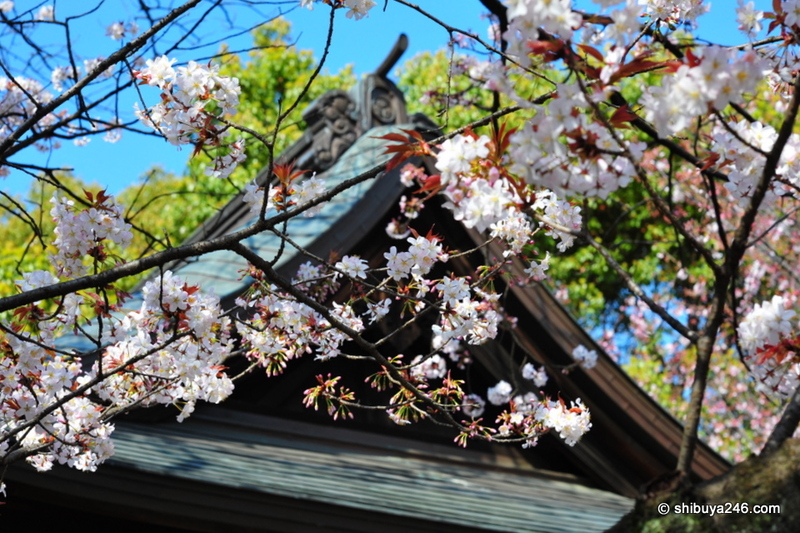 Beautiful colors of the Cherry Blossom contrasting with the wooden structure. The Toshogu Shrine is having renovations carried out at the moment, hence the need for the clever backdrop picture. One of the gates you pass through on the road to the Toshogu Shrine. You can see the colorful image of the festival food stalls set up through the dark wood of the outer gate. Toshogu Shrine standing behind the sakura tree. Lots of wishes being written up here with people hoping they come true. Lots of sakura, lots of color, plenty of beer and masses of people. The bright yellow and red colors match well against the dark clothing. So many people passing down this thin walkway to the Shrine. The stalls selling food were doing a great trade. Some of the 50 stone lanterns that line the road to the Toshogu Shrine. The Shrine buildings provide a nice backdrop for the Sakura. Nice clear skies to highlight the sakura. Looks like we have some fruit mixed in with the cherry blossoms. A view of the Five Story Pagoda in the background from the grounds of Toshogu Shrine. I liked the yellow light in the right hand side of this photo. Would have liked to see more of it shine through. If gave a rich golden feel to the scene. The Five Story Pagoda seen next to Toshogu Shrine. The Sakura trees line the pathway as people sit on the side enjoying the scenery and eating some food. Plenty of beer was also on hand. A very busy scene with people buying food at the various stalls on the way to Toshogu Shrine. Inspecting the writings of people who have made their wishes. Great choice of colors for this lady to wear to blend in perfectly with the Sakura season. It was a great time of year to visit Toshogu Shrine, despite the renovations taken place. I have lots more photos of Sakura in the main Ueno park and will have those ready to post soon. Hope to see it such a great scenery one day myself and snap some pictures of it too. have tried that a few times, but live view never seems to get a good focus, particularly with the faster lenses. any ideas? I suspect it’s still on your default mode for liveview. Liveview defaults to “Tripod mode” which uses a very slow way of focusing (which is ideal for .. tripods) there is a custom menu setting in : shooting menu -> live view -> live view mode -> “hand held” Whilst in live view mode you can use the “info” button to toggle displays including a virtual horizon. Live view meters only once every time you press the shutter half-way; display will black out and pop-in with corrected exposure values. Then press the button all the way in one go for a shot; halfway again will only re-meter; which you`ll have to do everything you look at something else. I do recommend F/5.6 for a wide angle shot in the distance to have everything in focus from left to right. Tough technically liveview should work for faster apertures too; check out the below shot I made using liveview and a 28/2 AIS lens (manual lens) set to 2.8 which is still pretty fast an aperture. Also whilst i’m at it; do upgrade to the latest D700 firmware if you haven’t. It drastically improves auto white-balance feature ! The first 100 shots I took on my new D700 were with the 1.00 firmware; so I knew how the auto white balance worked; then I noticed the firmware upgrade and it mentions improved auto WB performance; tested it out. And yes ! Quite true ! Especially indoors. The latest version is 1.02. If you don’t already have it I recommend installing it. Some great pictures here 🙂 Looking forward to seeing the rest of the Ueno sakura walk-about ! Tough truthfully these pictures also make me heartbroken; according to my original plan I would’ve been in Tokyo starting yesterday for two weeks; however .. big company project with career advancement options for me meant having to (regretfully) cancel it. Ueno is always my home base for my Tokyo trips as it’s more quieter and down to earth as opposed to staying smack in the middle of Shibuya or Shinjuku. I just love being able to walk to Asakusa (and hop on a ferry to Odaiba) or walk trough the Amayako market street up to Akihabara; or a the simple lovely morning bento munch in Ueno Koen. Wow, the color just pops off the screen. Do you use a polarizer filter on your camera to get those nice blue skies? With this amount of people. How long did it take you to walk from one end to the other? From my view point they look like oranges. Toshogu Shrine, Ueno, Japan Photo-Post http://bit.ly/b1n3eW Another fine piece of photography. Always amazes me the type of photos taken. Crowded place but I wouldn’t mind.